With a lumpy-textured rind, the entire fruit is edible but some choose to scoop out the small seeds from the soft flesh in the middle. They range from being the size of a small lime to the size of a baseball. The larger ones are easier to eat because the flesh is firmer, and the distinctive seeds are less noticeable. They have a light sweet flavour with a satisfying crunch, much like an apple. In Asian countries, guavas are often cut into wedge slices like an apple and then eaten fresh on their own or served with a spicy salt as a pre-dinner appetizer like mangoes and papayas or served with chocolate as dessert. Choose guavas that feel heavy for their size. The rind should be free of blemishes and yield to slight pressure (kind of like a pear would). The rind will range from being green to a light, almost faded yellow. For pink-fleshed varieties, the more yellow the rind is, the riper it is. The outside colour isn’t an indication of ripeness with green apple varieties. For the most part, guavas will be fairly firm, and will soften slightly when they are ripe enough to eat. There is more edible fruit when they are the size of a baseball or a tennis ball, but they are still edible when they are as small as limes. The smaller ones may be more tart, and are better used for cooking or baking. Guavas can be left on the counter for a few days to ripen if firm, but once ripe they should be stored in a plastic bag in the fridge and will last for several days. You can tell when guavas are ripe and ready to eat as they produce a heady fragrance and yield to gentle pressure. This is when they are at their peak. Wash the fruit with running water. Much like an apple or a pear, guavas can be eaten whole. Some choose to bite it like an apple and eat it out of hand, but others prefer to cut in half and scoop out the middle flesh. The seeds are edible but can be hard and somewhat unappetizing. You can also cut into wedges, slice or dice guava to add to cereal and salads. If you see any bruises or nicks, use a paring knife or edge of a potato peeler to cut it out. Guavas can be peeled and halved to use in recipes much like pears: poach them in wine, cut them to add to a fruit salad, or cooked as a compote or sauce (you may want to strain out the seeds). The most common guavas for eating fresh are the green apple guavas. They have a green, lumpy outer rind and a white or off-white flesh. Other varieties, also called strawberry guavas, have a pink to red inner flesh with the same green, lumpy outer rinds. 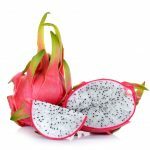 The pink varieties have a more tropical flavour and typically have fewer seeds. The pink variety is commonly reduced to a paste, found often in the ethnic aisles of the grocery store in jars to be used in sauces, desserts, drinks, and more. Guavas can be frozen in sugar syrup (1 part water to 2 parts sugar). Peel and half or quarter your fruit, then cover with syrup to prevent it from drying out in the freezer. Store in airtight containers or freezer-safe bags for up to 10 months. Enjoy frozen guava in smoothies or thaw and cook them into compotes or sauces. Guavas are a part of the myrtle family, meaning they’re related to spices like cinnamon, nutmeg, and cloves. Try pairing guavas with those spices to bring out the flavour of both ingredients. The seeds of guavas are edible but can be quite hard. You may prefer to scoop out the centre flesh to remove them if you’d like. Guavas still are somewhat of a novelty. Check the exotic fruit section of your local grocery store or visit a specialty or ethnic grocer. Pink guavas tend to have a more tropical flavour and fewer seeds (depending on the variety) while white guavas are more common and have a very light, crisp and sweet flavour. Guavas can be peeled and halved to use in recipes much like pears: poach them in wine or a spiced syrup. Cook guava to make a compote or sauce (you may want to strain out the seeds). Then use on top of a smoothie bowl, oatmeal, pancakes or desserts. Add guava to juices or smoothies! Slice them thin to be added on top of cakes, tarts, meringues or pavlovas. 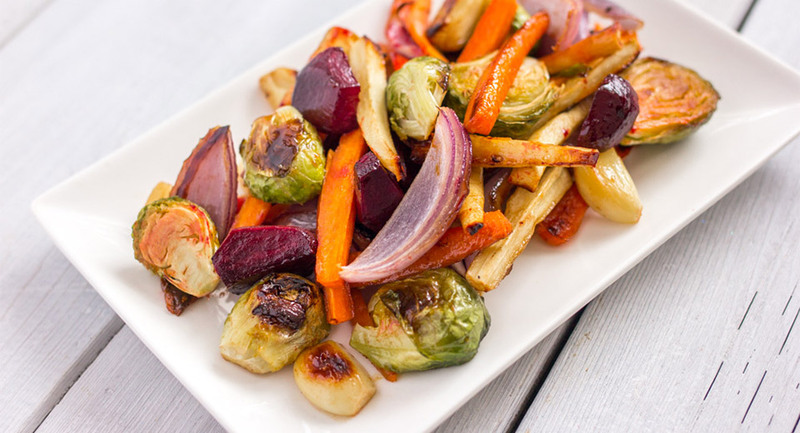 They can be chopped and added to fruit or green salads. Using a combination of pink and white fleshed guava would add a pretty finish! For a change, pack guava as a fun snack on the go. 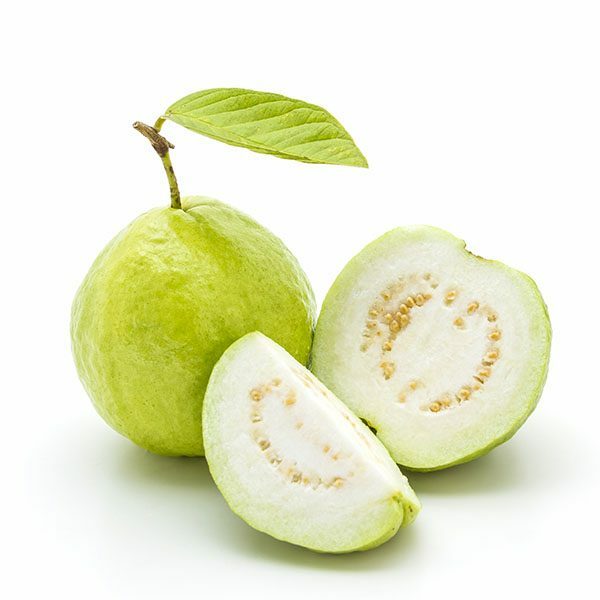 According to the Canadian Nutrient File, 100g of common guava (approximately 1 medium or 2 small white-fleshed guava fruits) is low in calories (68 calories) and provides many nutritional benefits. For your daily recommended intake of nutrients, 100g provides: 380% of Vitamin C, 22% of fibre (5.4 g), 22% of folate, 12% of potassium, 9% of Vitamin A, 9% of magnesium, and 4% of phosphorus. Pink varieties also contain the antioxidant, lycopene (100g can contain up to 5204 µg of lycopene).